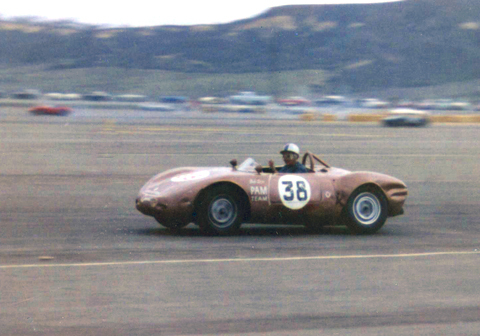 drove the lightweight Porsche-powered PAM (Patrick-Adam-Mitchell) Special in 1961. Racing Porsches (RS, RSK, etc.) of the era were built strong enough for European endurance racing. This extra robustness wasn't needed for American sprints. Hence Porsche powered lightweights like Ken Miles's earlier Cooper-Porsche, the later Dolphin-Porsche (also driven by Miles) and Patrick's very successful PAM Special. Patrick on his way to an overall win in the gloom at Del Mar on Dec.9-10, 1961. His fine driving in the homebuilt PAM Special led to a solid professional career. See him in James Garner's "The Racing Scene" on "Speedvision". Patrick on the back side of the Del Mar course. Note intact bodywork in this photo. Another look at the PAM Special. 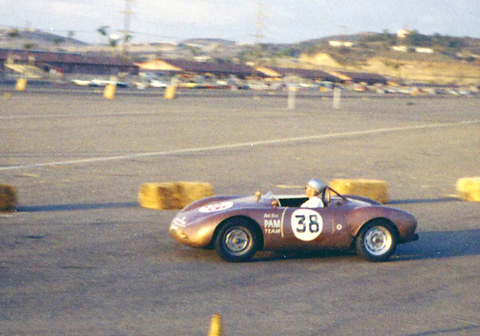 This time during the Riverside Grand Prix Oct. 14-15, 1961. Patrick was a legitimate contender for victory in the "Under 2-liter" class here, but failed to finish. Dr. Ernie Nagamatsu's !964 Cobra and the 1959 Old Yeller II.